Robert Pattinson further establishes his post-Twilight credentials in this fascinating and fast-paced thriller from New York indie filmmakers Josh and Benny Safdie. When Connie (Pattinson) and his learning-disabled brother Nick (Benny Safdie) rob a bank in a quite ingenious way, they think they’ve gotten away with it, only for things to go horribly wrong moments later. With the vulnerable Nick in jail, Connie races through the night to try and find the money to bail him out. The film moves with such relentless, break-neck momentum, even in the quieter moments you are so consumed by what the next catastrophe to befall Connie will be, you can barely breathe. Bathing the screen in a wonderful mix of grime and neon, the Safdie brothers make contemporary New York seem scary again. They find the few dark and sleazy blocks that have somehow resisted gentrification, and drop Robert Pattinson right in the middle of them. As for Pattinson – the handsome English boy you might have heard of – he is on terrific form. Wired and wiry, his performance as Connie is arguably his best yet. He has all the grit and rough edges you associate with a “serious” performance, but without ever straining and going over the top. He brings to life a history for both Connie and Nick that is only hinted at in the film. It is a subtle, heartfelt, and brilliant performance. In the venn diagram of Sonny Wortzik, Travis Bickle, and Charlie Babbitt, you would find Pattinson’s Connie in the middle. The film is bolstered by a fantastic, award winning score by Oneohtrix Point Never (aka Daniel Lopatin). A constant, synth-driven sonic blast of swirling layers of electro. You just know these are the crazy sounds inside Connie’s head. At times it comes through like a strange hybrid of Brad Fiedel’s amazing and iconic work on The Terminator, crossed with a sleazy late night 80s cop show. 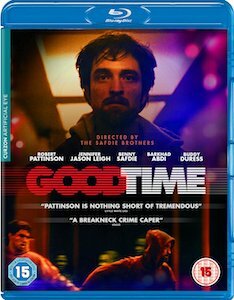 Like a film from another era, Good Time pulses with paranoia and nervous energy. A lean, character-driven thriller, that is bleak, beautiful, and bloody violent. No one’s having a very good time in this film, but give it a watch, and I guarantee you will.